Perfect for the tennis season - Wimbledon 25 mins door to door, Queens Club 45 mins. Pay and display parking is available on the street outside at £2.60 per hour for a maximum of 4 hours at a time. This is in force from Monday - Saturday, 9.30am - 5.30pm. We can provide visitors' parking permits at a cost of £7.20 per day. Please ask for these when booking as we need to order them for you. Wonderful stay in charming section of town. Lynn was wonderful in every way! Thank you for extraordinary customer service. 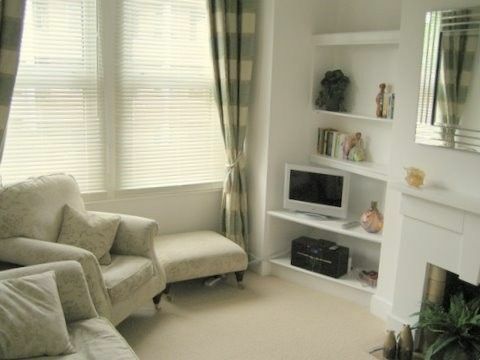 The property is very well-appointed and convenient for local shopping and public transport. It is a warm and welcoming environment and the owner is most helpful. Would thoroughly recommend. Wonderful accommodations, very well appointed! The apartment was very well appointed, just as described. My party of 3 adults were very comfortable in Lynne's apartment. Easy to locate, access to apartment was very convenient, train station just a couple of blocks away, easy access to major London attractions. All rooms were comfortable, WiFi worked well, and there was a desk in a hallway alcove that made using my personal computer very convenient. Easy access to electric for recharging devices, bathroom has a separate shower and tub with good water pressure and hot water as needed. Very clean!!! Would highly recommend staying here. We stayed here with our two children (4 and 1) and it had everything we needed. We felt at home and location was great too. trains and grocery store. We were able to walk about 10 minutes to the underground then it was an additional 15-20 minutes to major tourist attractions. We had a family of 5 and the unit was perfect for us all. Everything about the place made us feel like home. We all had our rooms to relax in, a living room to get comfy and a dining room for family meals. A very nice neighborhood with a grocery store and nice restaurants within walking distance, and public transportation (buses and Tube) nearby. Lynne had great communication throughout the process and made things very easy with tips, ideas etc. It was a pleasure to deal with Lynne, and we had a great time and vacation. We would definitely stay again in Lynne’s unit if we vacation again in London. Only a short trip to the centre of London and all the attractions to be found in this vibrant capital city. Big Ben, Houses of Parliament, The London Eye, The O2 Centre, Wimbledon Tennis museum, Wembley Stadium and Arena, Tower of London, Tower Bridge, London Aquarium, Buckingham Palace, West End shopping.....the list is almost endless! Other Activities: All the sights of London!